What's your favorite sunchoke recipe? Do you have one? 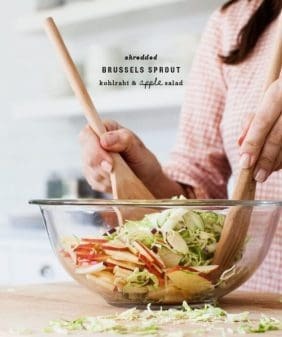 I love this caramelized sunchoke & Brussels sprout salad - a perfect light winter meal. It’s hardly winter in Austin anymore, but I’m still trying to keep all of you snowbirds in mind. 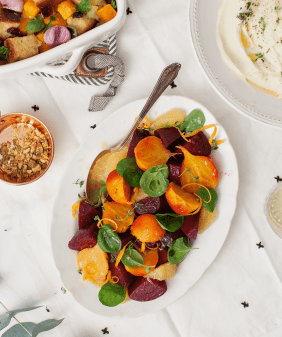 Enter: the winter sunchoke salad. This sunchoke recipe is full of warm, roasty goodness and brightened up with a tangy lemon dressing. Have you cooked with sunchokes? Do you have a sunchoke recipe to recommend? They’re new to me, but I just love them, so I was eager to develop a sunchoke recipe of my own. Sunchokes, also known as Jerusalem artichokes, have a potato-like quality. I like them both thinly sliced and roasted or sautéed with butter and oil. 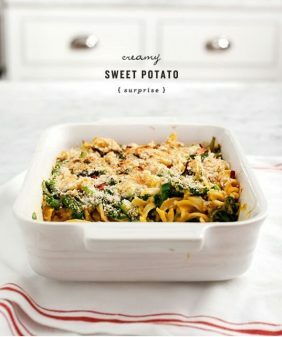 Fortunately, they’re less starchy than potatoes, so they don’t make this salad too heavy, but they do bring a nice substantial bite to it, and I like my salads to have some substance. Shaving the brussels sprouts makes this salad pretty fast and easy. With just a few minutes in a pan, they develop a sweet caramelized flavor, a method that I’m surprised took me this long to discover. But now that I have, I’ll be using it again and again. I use the same pan to cook the thinly shaved sunchokes in this recipe, making them a nice, crisp contrast to the Brussels sprouts. Before serving, I toss the caramelized veggies with pine nuts, salad greens, a little Parmesan, and a splash of the lemony Dijon dressing. Make the dressing: In a small bowl, whisk together the dressing ingredients. Taste and adjust seasonings. Set aside. 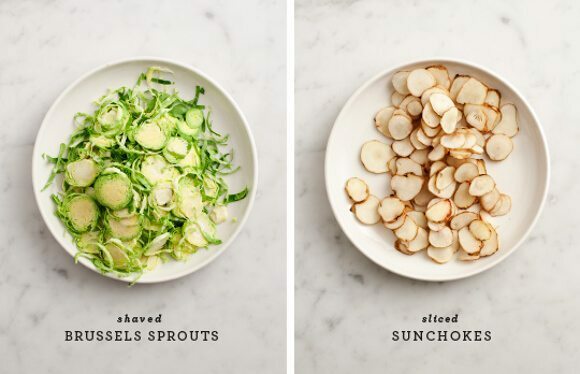 Lightly salt the shaved brussels sprouts and sliced sunchokes before you start cooking them. Heat the olive oil and butter in a large skillet (use enough just to coat the bottom). When the oil is hot, add the sunchokes and cook them for about 2-4 minutes per side, until they're tender and a little bit crispy around the edges. Remove them from the pan when they're done. Wipe out the same pan, heat more oil and butter. Add the brussels sprouts, cooking for about 2 minutes per side until they start to get a little golden brown on the edges. (Don't crowd them in the pan - you might have to work in batches). Remove from pan and set aside. Toss everything together with some of the dressing. Add as much dressing as you like and serve with extra on the side. Top with pine nuts, red pepper flakes and a few shavings of Parmesan if you like. This is such a fabulous meal! Yum! 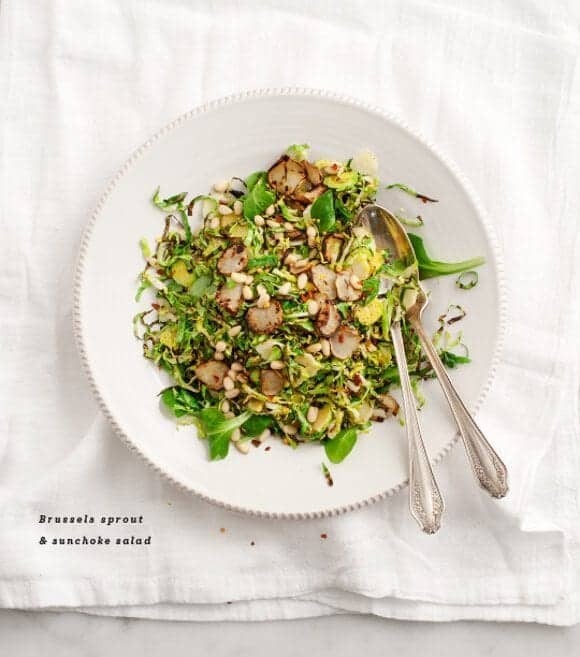 I love love shaved brussels sprout salads but have never cooked with sunchokes. I am a fan of anything potatoey, so I will have to give them a try! Love sunchokes! And love that you’re keeping us northern-dwelling types in mind, Much appreciated 😉 Beautiful salad, Jeanine! I’ve never cooked with sunchokes, but will have to try! Looks delicious. I wish I would have had this recipe last year!! I was given a bunch of sunchokes from a friend’s CSA and couldn’t find much to do with them other than soup. Your salad recipe sounds delicious!! clever combination of ingredients. love the idea of brussels and chokes, together as one! This is such a timely post! I just bought sunchokes to try for the first time and was thinking of doing something similar with them. I’m still on the fence between a soup or a salad, but if I have some leftover, I’ll be making your recipe for sure! I’ve never had a sunchoke but with your description I’ll have to check them out! It feels like winter just hit here in Colorado. We’ve had a cold snap this week! Dammit — there was a whole box of sunchoke starts at the seed swap I just went to, and I didn’t grab any because I didn’t know what I’d do with the crop. This looks delicious. Hoping they’re still available at the farmers market. Unfortunately sunchokes disagree with me but I really love their taste. I think that salsify tastes rather similar and would go brilliantly with the sprouts. So pretty! I combined this salad with your winter roasted kale salad. And threw in some roasted cauliflower (I’m still not over cauliflower). Delicious! Thanks for the inspiration. all my favorite winter vegetables! This looks so delicious! Love both sprouts and sunchokes – im sure the mix of flavors are great together. Love your blog, I’ve just added it to my ‘inspiration’ page on my blog. 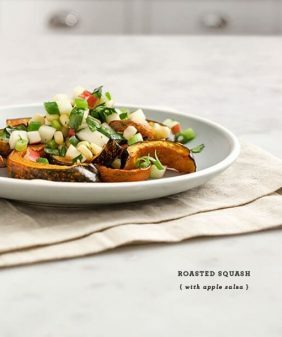 I’ve never cooked with sunchokes before, but this recipe has definitely inspired me to try! Thanks! 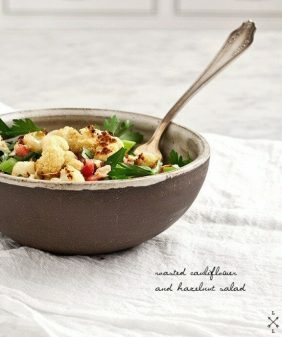 Looks like a truly delicious, unique salad. Happy weekend! Brussels sprouts are actually the best thing ever! Oh dear! 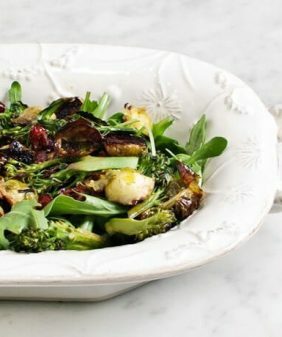 Brussels Sprouts are among my most favorite of salad ingredients and I’m always looking for new combinations. Love! Hi Asha, I’m so glad you liked it! Hi Dina, that’s so great, ha! Feeling the pressure to pick out a good one now… what was the first one you tried? The first one was the walnut mushroom veggie burgers. Divine. Made this salad for dinner last night – added some millet cooked in a light veg stock to bulk it out a little. It was delicious, and the dressing is well balanced. I’m currently heating up my leftovers to pop an egg on top for breakfast!